So fun reading about all the great things you girls collect. I'm inspired to start a few collections of my own, beyond the dust bunnies that are currently at the top of my list. Congratulations to Lori who is our randomly selected winner of this vintage apron. Lori, contact me at judith@dancewhileyoucook.com to claim your prize. Speaking of garage sale season, I stumbled upon this adorable vintage apron a few weeks ago on my regular Saturday morning outing. It appears to be handmade from a bygone era. 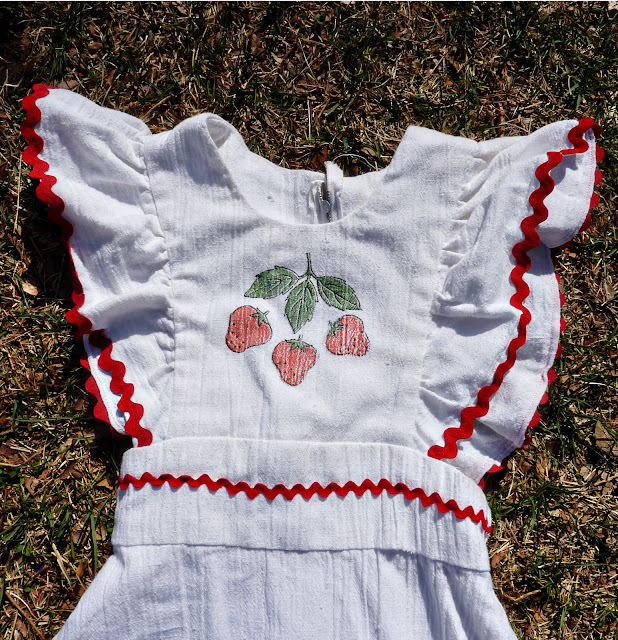 I feel in love with the darling strawberry applique on the breast. 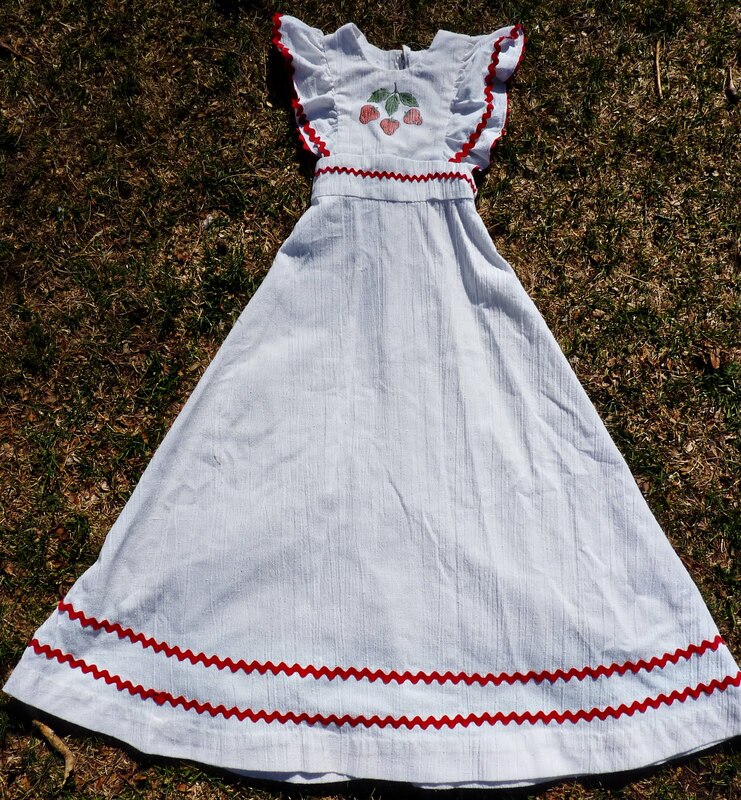 This is the perfect gift for a girl who loves vintage aprons. Or at least I think it's an apron. It is not the traditional wrap around style. More like a dress really, with a zip up back. I find the most interesting feature of this little white and red number to be the itsy bitsy high waist line. It measures 20 inches around. So, ever since I bought it, I've been trying to figure out who this was designed for. A housewife of a bygone era who measured 20 inches around? A tall chid? A life-size barbie doll? Honestly, I can't figure it out. But I don't need to. I know that someone in your life collects vintage aprons, either to wear or display. I know you're thinking of her right now. So go ahead, enter my contest to win this apron. Tell her to make a stop over to Dance While You Cook to enter for herself. Share this post on Facebook. Go ahead now. Don't be shy. I know there is a woman in your life who has a secret love affair with vintage aprons and she hasn't told you yet. So do her a favor and let her know about this giveaway. Win it for display in your vintage kitchen. Win it for the dress-up box of your next door neighbor's daughter. Win it for yourself to fulfill all your homemaking fantasies. Leave a comment below and you'll be entered. For a chance to win this vintage apron, simply leave a comment on this post telling me your favorite thing to collect. Ceramic mugs? Shoes? Dust bunnies? Any answer of any kind will get you entered to win. I will choose a winner at random on Monday morning May 2, 2011. Check back on this post that morning to see if you've won! i collect bowls. i didn't know i did until mark gently pointed it out after we started moving every few years... but i see now: i collect bowls. I love your blog, all things vintage, and I love this apron :) I have a deep and insatiable love for books and have been collecting classics and bestsellers for years in hopes of one day having my very own personal library at home. I love to collect vintage linens and quilt tops. Ah, my TWO favorite things to collect... ok, 5. Enamelware. White milk glass. Vintage linens. Vintage dishes. Aprons. Enjoy reading your blog and LOVE your blog name. It's great!